As you are all aware, I have been working my tush off all year and getting in shape over at Elite Performance Fitness in Stockport, Cheshire. In the run up to Christmas, there is always the temptation to eat and drink a little more than you should and I have been feeling a bit apprehensive about how I can stay on track during those festive few weeks. Elite Performance Fitness are hosting an event on Thursday November 14th that will talk attendees through how to make some small changes that will yield big results. My #adresstoimpress challenge continues as I work towards getting into my dream dress in December, so why not take on the challenge with me? 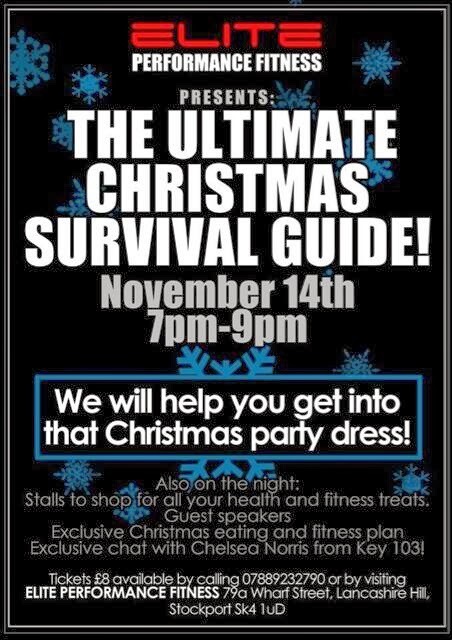 The gym will cover the nutrition and fitness elements and there will be brands exhibiting who can help you achieve the glamorous Christmas look you want to go for! If you have any queries or want to reserve a ticket please contact 07889 232 790.